The Kobra 1300-R Light Duty Trimmer is an A0 desktop rotary trimmer. Meticulously designed in accordance with the British safety standard BS 5498, this light duty trimmer can cater the cutting and trim needs with ease and high precision. The 1300-R Light Duty Trimmer is specially designed for desktop operations. 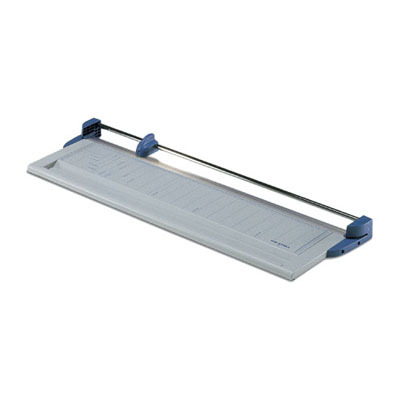 You can use this trimmer for trimming plotter and large size paper including aluminum film, paper, cork sheets, labels, photographic film, light cardboard, PVC film to celluloid. Its special side opening lets you cut paper sizes larger than the rated cutting. While its automatic paper clamp ensures burr-free cutting, the convenient built-in housing accommodates paper rolls to ensure smooth and continuous cutting operation. The Kobra 1300-R trimmer also features ISO 9000 compliance special sharpened carbon steel blade delivering long-lasting cutting operations. These blades are easy to replace via the push-button mechanism. It comes complete with a 36 months defective parts warranty.